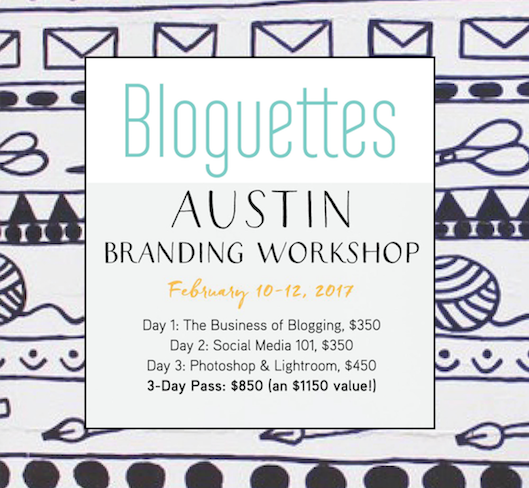 The Bloguettes Are Coming to Austin! If you're a blogger, creative, or entrepreneur looking for a way to stand above the crowd, The Bloguettes Branding Workshop is just the thing you've been looking for! Over the three-day workshop, The Bloguettes will provide you the training you need to elevate your digital presence in the entrepreneurial age! Students will be equipped with all the basics of Photoshop, social media, marketing, photography, and the business of blogging. Through hands-on learning and collaborative discussions, students will be armed with the tools to grow their following on social media, craft a good photo, monetize their blog, and reach out to create lasting partnerships. Whether you’re a budding startup, a newbie blogger, or wanting to rebrand a veteran company, students of all experience levels will leave with the direction, confidence, and skills to build their brand from the ground up! Lunch will be provided for all three days. Please let us know ahead of time if you are a vegetarian or have any allergies. Email info@bloguettes.com to find out about our student discounts and payment plans. So, what do you say? Are you ready to take things into your own hands?